A trip to the library should be enlightening, and I read a lot of books so I go at least twice a month. I usually have my card and the transaction process for checkout works fine. That is unless you bang up into a dis-engaged person running a rigid transaction processing system that is NOT customer oriented. I had a book on reserve that had a pickup deadline and I was returning that day from a camping trip, pretty scruffy as well as somewhat disorganized, but certainly relaxed. Then I made the mistake in thinking that just because I was a regular customer to this small branch, the transactions could be accomplished without my library card. no wallet, it being temporarily lost among all my camping gear that was on the floor of the garage, so no picture ID or library card. Really? Does that process make sense to customers? I mean, what is my exposure here from a privacy standpoint? The Federal Government set up a commission that is demanding the states release voter names and social security numbers and addresses and voting affiliations and voting history to supposedly prevent future in-person voter fraud (which exists in a tiny percentage) but my LIBRARIAN is going to protect by privacy by not lending out a reserved book in my name without a picture ID? How would any potential thief even know that the requested book was in my name on the shelf? And some internal thief could certainly just take the book and walk out if the marketplace was that lucrative for stolen library books, right? A simple solution is that the leadership of the library would be to get the clerks to improve their service by calling the customers by name. I see the person that cuts my hair a lot less than my library visits and THEY always call me by name… That is a fairly common thing and positive thing for organizations with a small customer base and repeat customers. The leadership should allow their people to act with judgement and sort through the situation logically and allow intelligent and reasonable deviations from their policies, procedures, rules and regulations. They could have asked me for some history of what I had borrowed in the past, or my address or phone. But they made NO attempt to think through how I might be verified. They simply said NO. The library is not the DMV, where people might be trying to get fake IDs. It is The Library! They have books and tapes, not jewelry or gold coins. Nobody is trying to really steal from them, are they? The leadership could CHOOSE to do things differently and the management could dis-un-empower the clerks to deal with their taxpaying customers in a bit more friendly way.They should not have stupid, inflexible systems that frustrate their taxpaying customers or their employees. I am also publishing a short letter on this in the local newspaper, since I cannot be the only person this has happened to and we DO pay for their books, building and salaries, right? I also came back to this and redid the graphic just a little. They really DO need to have some Disruptive Engagement and arrive at a better customer service quality standard. Processing and handling transactions is NOT service quality, meeting expectations actually defines it. Managers need to have policies that empower people to make good decisions, not simply defend a bad policy! I listened to a great presentation yesterday by Mercer on managing engagement, the need to focus on key metrics but the reality of driving behavior at the very bottom of the organization, which is what engagement is. Nicely presented, with great graphics. And I look forward to getting a copy of the information, statistics and related materials. It is totally clear that workers and supervisors and managers are basically un-involved and un-engaged in so many workplaces. And it is management effectiveness AND the workplace environment that is behind this problem. It is NOT a “senior management leadership issue” that can be corrected with more surveys and more executive development. only ONE IN FOUR employees “strongly agree” that their supervisor provides meaningful feedback to them, that the feedback they receive helps them do better work. Only 21% of employees strongly agree that their performance is managed in a way that motivates them to do outstanding work. Only 11% said they were groomed for that role through some developmental training or program. corrected with more surveys and more executive development. The solution requires involving workers in workplace improvement for both process improvement and more self-determination and personal growth. It is about demonstrating that the supervisor is actively listening and helping to implement ideas. It is about the workers and the management team removing roadblocks that are perceived to be operating that are blocking engagement and the ability to act empowered. Simply, it is about facilitation and feedback. 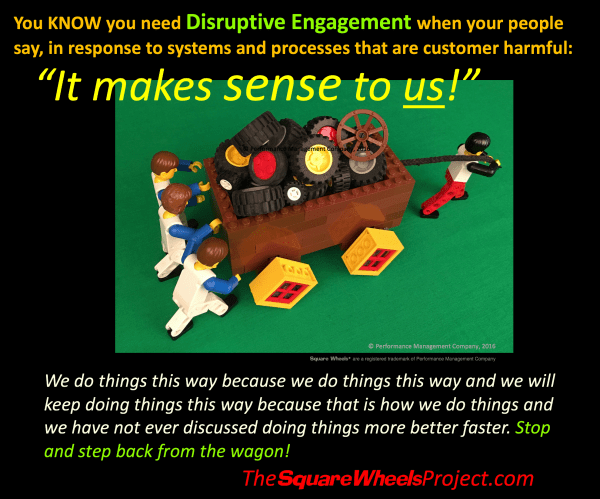 The Square Wheels Project is a simple online training program focused on using the metaphor of Square Wheels® as a tool for communicating about issues and opportunities, and it is accomplished by teaching the supervisor basic facilitation skills and providing a simple and bombproof tool for leading discussions. It also supports these supervisors with peer-level communications about issues and questions and dealing with problems and politics. So, without cost or training or doing anything but downloading two pdf files, go play with this idea. Below is the really simple explanation of how it works. 1 – Give a “how does this represent how things really work” card (left) to each person in your meeting and have them discuss the image in small groups. Let them consider possibilities. Ask them to share their thoughts. 2 – After discussion, give one “what might be some of our Square Wheels” card to each person and then ask them for some of their thoughts. 3 – Process the ideas as you wish. Do not defend the status quo but consider these thoughts and ideas as possibilities. “What else?” is a good response. If you like what you see, which might start out with some discussion about the problems of processes and leadership and teamwork and ideas in a general workplace situation and the transition into what some of the issues might be in your workplace, you will get some idea of the power of this metaphor for changing thinking, language and goal-directed performance improvement. We have a variety of workplace improvement tools available for purchase, all framed around the idea of changing people’s perceptions and behavior, driving improved teamwork and communications, and generally working to disrupt the way things are and create a more positive workplace. This will be a short post, with a link to a solid article and one illustration. Managers who don’t know how to meet the engagement needs of their team become a barrier to employee, team and company performance. And a disturbingly high percentage of managers around the world are not meeting the needs of their employees. Actively disengaged employees (24%) outnumber engaged employees (13%) by nearly 2-to-1, according to Gallup — implying that at the global level, work is more often a source of frustration than fulfillment. If work looks like this, which it seems to, can’t we actually DO SOMETHING to change the rope? Can’t we make things more involving and engaging by simply asking people for their ideas for improvement? That is what we are trying to teach with The Square Wheels Project: a simple facilitation process to allow supervisors to ask for ideas for improvement. Boss. In organizations, a lot of people know precisely who that is. And that can be a positive or a negative, as I will try to explain. My dad owned a small trucking company in South Jersey for nearly 50 years and he was the boss, for sure. He made all the decisions, ran the office, did the collection, gave his customers bottles of hooch every Christmas and ran the company as a one-man band. He had a half-dozen trucks and he did well enough to buy a summer house that gave our family a place to be at the beach, boats and cars and all that. From that perspective, my dad was a good boss. On the other hand, there is an aspect of BOSS that is not so good. You would sometimes see it in how he might interact with a driver. Orin was always stopping in on prospects to generate new business and my dad generally never wanted to talk with him, telling me to tell Orin he was not around, for example. Or if there was a problem, the conversation tended to be one-sided. My dad did not generally appreciate the thoughts and ideas of the guys who worked with him. “I’m the boss, here” generally infers complete control and a bit more yelling and telling than asking and listening. Boss translates to Ruler, the Decider, someone who has all the bucks and they stop right there. I see the word “autocratic” in the management haze, the imperial-ness of the boss as a person. I see The Boss theme happening in an organization where 60% of the employees feels that no one listens to their ideas or respects them for their work or personal accomplishments. I see The Boss theme in organizations where 10% or less of the employees see themselves as actively engaged but the vast majority rating themselves as un-involved or even “Actively Dis-Engaged” and choosing not to be involved and engaged, with the correlated high levels of absenteeism and turnover. And even some sabotage (see this post of mine). And, I see The Boss as someone who simply knows that they have the right ideas and approach and that they could not possibly benefit from any training on listening skills or engagement or innovation facilitation. In those cases, BOSS spelled backwards probably is a pretty good explanation of their overall attitude and approach to employee involvement and engagement. John was one such animal. He was The Boss, president of a company that asked me to help improve their customer service. We did some initial work and then had one of their first ever Manager’s Meetings, an all hands deal at a golf resort where we had scheduled some work sessions around some golf. You might have guessed that John was a Big Time Golfer, which is why a golf course was selected for a business meeting, and why meetings were actually scheduled around his tee times. John obviously saw himself as, The Boss. John was not there the following year, since his charter by the board of directors to improve operations and customer retention was not going that well regardless of what we tried to do at the lower levels. if you don’t feel the boss cares for you. Perceptions are important, and if workers don’t feel right about the company, it is hard to get them to do those things that exceed customer expectations. It is hard to get them to feel motivated to perform at moderate to high levels. Sure, the top performers perform, but they always do that for intrinsic reasons until they burn out and leave. Note that average employees are often involved in Presenteeism. the situation where they show up and accomplish the minimally accepted level of work and performance competence. Aldo note that the poor performers are actively un-involved and sometimes intentionally sabotaging the work. Why not choose to do some things differently to get a result that is #morebetterfaster? So, you might simply reflect on the simple themes in, “Hey Boss!” Asking for and listening to ideas from your people does not involve a lot of training or skills, just the positive intention to treat them effectively. Any questions? Just ask me, because I am The Boss! How many people have seen Square Wheels illustrations? Got a problem with motivation, engagement or productivity and looking for a simple and bombproof, proven tool? Take a minute and read this. And Think! 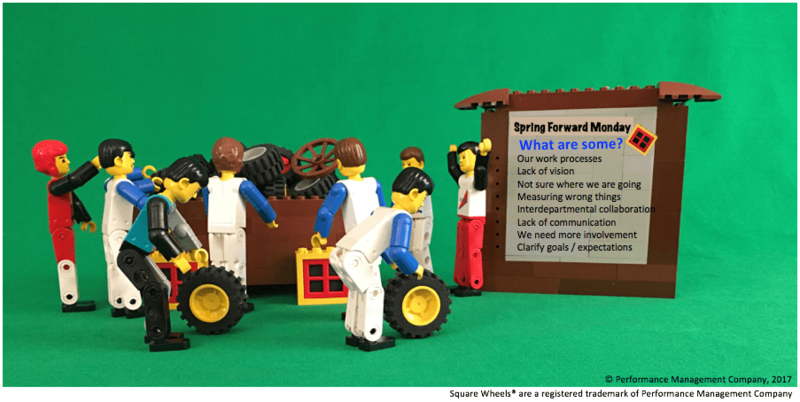 A team of us are working at building our online teaching resource wrapped around the idea of “stupidly simple facilitation” through the use of my Square Wheels® theme. The project has gone through a number of phases and Dan Stones in Melbourne has jumped in to help us drive all of this forward. Expect some fun stuff as we continue to rock and roll. That is a really good question, for which I have no clue. History shows I have been presenting the theme at conferences and workshops since 1993 when I started using the main cartoon, Square Wheels One, done in black ink by my friend Roy Sabean. A few presentations later and I had 4 and then 7 different illustrations. When I got to 13, people started asking me for copies to use and I started selling a set in a brown envelope as colored transparencies and black line art. Then, they wanted me to explain how to use them. Really? “Just do what I do or do your own thing,” I said, to no avail. They wanted me to write that stuff down, which resulted in a book with photocopiable masters. That was back in 1993, with the first book published in 1994. By 2004, we were in our fifth edition of The Big Book, a package containing descriptions for using more than 200 of the illustrations and for making transparencies. I am guessing that I still have a 3 or 4 foot stack of transparency versions of these materials in different places in the house! So, I did not have an answer for Dan. Since 1993, I have presented workshops in 38 countries and dozens of conferences, including more than 10 trips each to places like Singapore and Hong Kong. And we have sold a lot of a variety of books and electronic toolkits since we started all this more than 20 years ago. My squarewheels.com website went up in 1998! 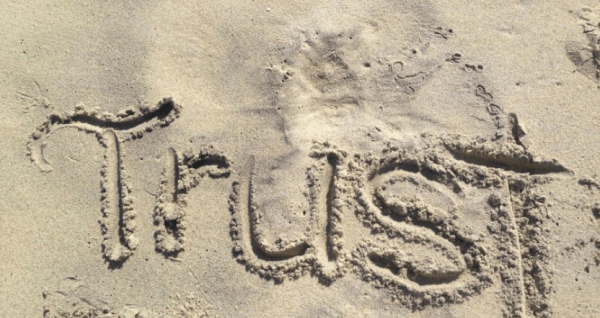 Communication and connection are the cornerstone of relationships – a quarter to a third of employees believe their managers seldom or never listen to them, understand their issues, seek their input and ideas, or help them to resolve the issues and challenges they face. 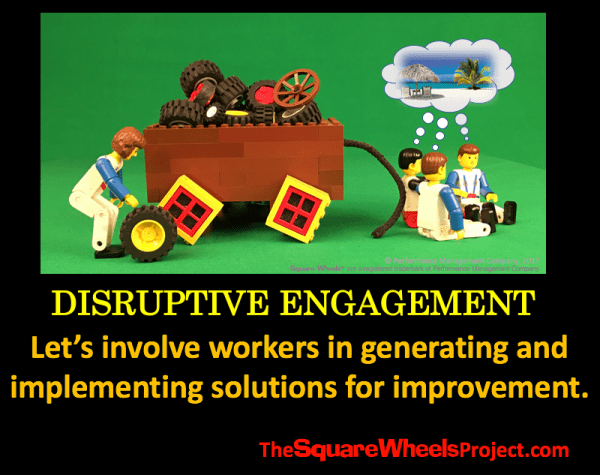 Two-thirds of the employees worldwide have NOT had their manager use the Square Wheels theme in a discussion about improving their workplace involvement and performance. If they did, things would probably be different. Square Wheels really are everywhere and the round ones are already in the wagon. Communications would have HAD to improve! We believe that managers should be motivators, and that engagement comes directly from active involvement and communications about issues and opportunities, about goals and expectations. It is about teamwork and shared perspectives as well as about ideas for improvement/ We think “this engagement and motivation stuff” is pretty straightforward and that people are intrinsically motivated when they feel a sense of ownership involvement. Monday’s, most typically, are the least favorite day of the work week but the Monday following the Daylight Saving’s “spring forward” time change, arguably, should be considered the worst of Mondays being that people find it even more challenging to face this workday since they are still adjusting to having lost an hour from their lives the day before. According to numerous studies, the attitudes and happenings around this lost hour cause this Monday to be particularly low in workplace productivity. What might you be doing to counteract the loss of productivity that will most likely occur in your workplace on Monday, March 14, 2016? 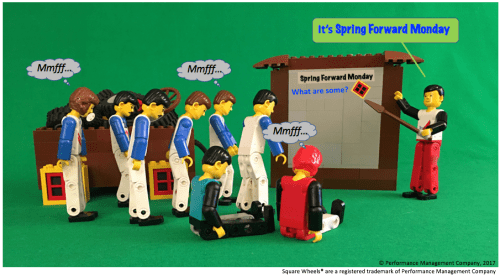 What is the Spring Forward Monday Concept? Managers and leaders can gather their employees together and seize Monday, March 14, 2016, as day for workplace improvement by inviting ideas, innovation and involvement for improving workplace practices. By doing so, people can get away from their desks and become energized by taking part in a process that can make a positive difference for everyone. It’s simple. Facilitate a session that will stimulate and engage employees in sharing their perspectives and ideas for making a better workplace. Doing so will give them a feeling of empowerment and an opportunity to create improvements and increased workplace happiness. You can purchase this Toolkit here for only $24.95, for a one-time cost with unlimited use with any number of people. giving you the choice of using either version. 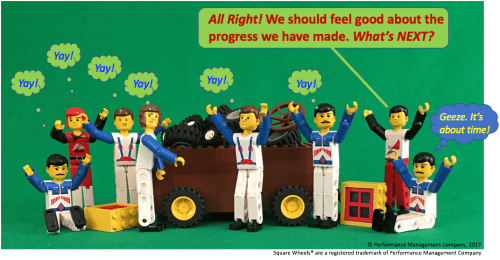 A collection of Square Wheels Lego Posters that can be hung in the workplace as anchors to the insights gained. All yours for only $24.95! 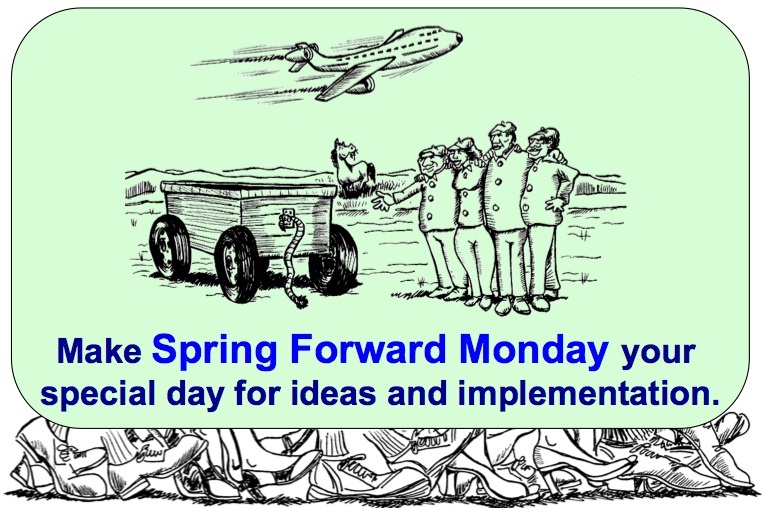 Whether you choose to use this Toolkit or prefer to consider another way to approach the Spring Forward Monday concept, it surely makes sense to make a difference in everyone’s present and future workdays through involving them and energizing them in the journey forward. “Nobody ever washes a rental car“ is a phrase I have been using in workshops and in my writings since the mid-80s to describe the basic issues around ownership involvement and engagement. The basic concept is simple: people do not take care of things very well unless they have a feeling of ownership about them. Seriously? Of course, someone in a workshop will pipe up something like, “I washed one once” when referring to their own car-renting experiences, but under a followup question, they also admit that they did it because they totally trashed the car and were worried that the rental agency would fine them or something, or that their spouse was so appalled by the awfulness of the exterior that he or she would not get into that car! What goes faster than any police car, handles speed bumps and potholes like a Humvee, corners faster with more screeching tires than a drifting WMV, and can crash through small trees and bushes like a tank? Give up? It’s a Rental Car!! On the left, we have typical organizational reality – leader pulling and people pushing and not much alignment, engagement or communications. On the right, we have people actively involved in making improvements to the situation, with the obvious support of the manager and others. Taking time to be involved generates engagement, can help to implement better processes, and can generate peer support and even more organizational successes down the road. 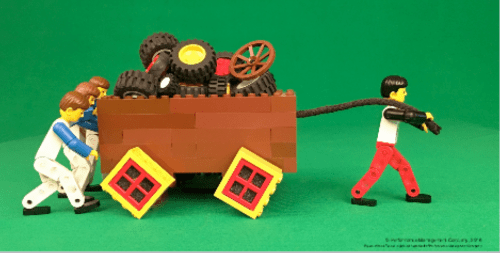 In this case, you might consider that the wagon is now beginning to roll downhill faster than the wagon puller finds comfortable. When people feel pushed, they generally push back and resist the change. It is ownership, again, but in a situation reverse to the above. Managers can also resist changes and ideas brought to them from the teams. It is a natural thing for those who are facilitating change and innovation. Leadership is not a simple thing. So, Heads up! Engage them where you can. And a new client has just completed a company-wide survey showing all the many kinds of task-interferences getting directly in the way of actually demonstrating leadership skills among her managers. (She promised me the data, so more to come on that, for sure). We are demanding a LOT of people in the workplace, so much so that it is hard for them to do any workplace innovation or for managers and supervisors to do much to build collaboration and teamwork to make improvements in inter-departmental kinds of things. The funny thing is that this really seems true, with lots of data to back it up. Companies and workgroups continue to do the same things, over and over, and expect improvements to occur. 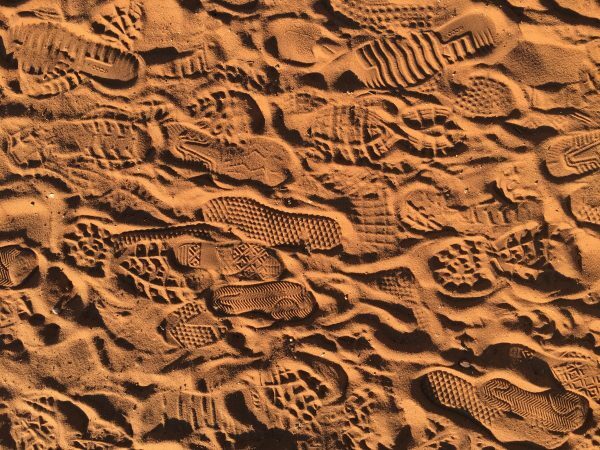 A few companies are doing things so differently and better than their competitors that they have significant, sustainable differences in operational data and in things like creativity and innovation. While some just plod along like they always have, thump thump thump thump. AND LOOK AT ALL THE PROGRESS WE HAVE MADE! But the reality is that the Round Wheels already exist and we can choose to do some things differently to make improvements. You can CHOOSE to do things more better faster. Innovative Ideas are at hand, if only you might step back from the wagon! You might also find this slideshare to be of interest. It was suggested that I link to it. The focus is on making the office environment more worker-friendly and supporting through the use of lighting, furniture and design. Click on this textlink. 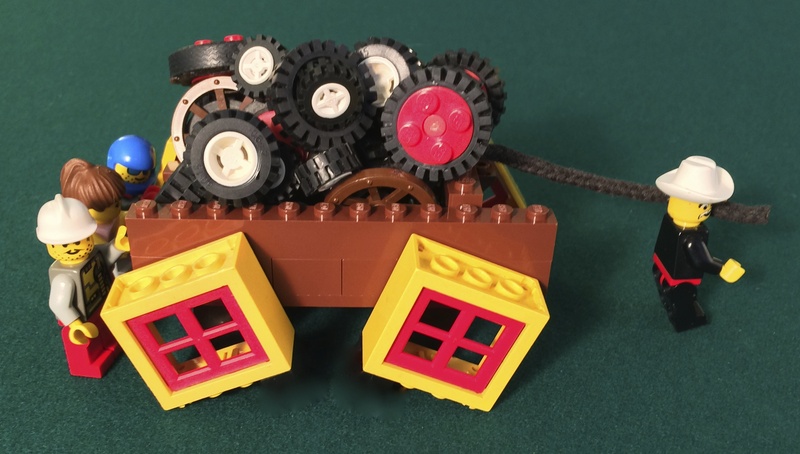 Check out our Square Wheels Icebreaker Toolkit – $20! A Dance of Change – something new? It was funny to read a little blurb in the ASTD Training & Development magazine about an article to appear next month. The abstract said that 70% of change initiatives continue to fail (which is on par with how many strategy improvement initiatives are not really successful) and that the existing change models are all pretty good. I won’t mention the author of this, since I am basically panning this solution — Emotional Intelligence is not an easy thing to grasp, much less implement since it has so much to do with personal growth and personality. We’ve been fooling with EI concepts for 20+ years, just like we’ve been proposing 7 Habits and all sorts of other silver bullets to solve the problems of organizational improvement. I’m one who very strongly feels that we just need to forget about so many complicated models of how things work and how things need to have some new Training Solution proposed by a cadre of consultants who will retire on these efforts. How do you implement change? Identify the Square Wheels and ask for some Round Wheel solutions. Do this in the context of moving from where we are now to where we want to go (in the near or far future). Celebrate small successes to generate continuous continuous improvement and allow people to work together in simple teams (with necessary resources of time and funding) to actually implement such changes and improvements. I mean, this whole thing about involving and engaging people in workplace improvement is really the simple task of involving and engaging them in workplace improvement. Where is the rocket science in all this? Why do we keep adding so much complexity — other than for profit motives and self-aggrandizement — when the reality is really easy to accomplish. This concept is also simple: Everybody needs to feel like they have an ownership stake in the ideas and the outcomes, even the management team. So. Keep it Simple. And Just DO it! The conversations about time availability for coaching and team building by supervisors continue to get interesting. There is an interesting article at the Washington Post called, “How a company weekly meeting winds up consuming 300,000 hours per year” and written by Fred Barbash. Go to the link above to find out more about his article and the original research. My friend Steve Davis also writes about some of these same issues, but from a personal perspective related to values and goals. Life is not simply about how busy you are or how you want to appear. Read Steve’s perspective here. These conversations and data from corporate research like the above simply seem to confirm that “meeting with people on engagement” does not seem to be one of the critical values of large organizations and thus we really cannot expect the supervisors to simply want to do that with what little time they have. We have a need to Spring Forward and really make a difference with the workers in most organizations. They have ideas for improvement and we can dramatically impact intrinsic motivation if people felt like they were on the team and that management really cared. That’s my view, and I am sticking to it. Presently, supervisors probably do not have the time nor the inclination to rattle the cages and ask for ideas about workplace improvement. They are not empowered to form teams nor do any of these people have much “release time” in which to fine-tune and implement things.